Mhkitaryan also had the most assists in the bundesliga. What does that tell you about the quality of the league? Its looks like he plays against fishermen. I think sancho is a good player but is very overrated. Hope if we go in for him we don't spend more than 65m or that's just a waste of money. Dembele went for that much because that is what superstarlets cost these days. Watch. What difference is there to 4 years left on your deal or 5? Bayern just paid £68m for a left back I have never heard of. This kid will cost at the very least the price of Dembele. Maybe I didn't put across the nuance of my point that well. Sancho will be expensive, but there are reasons why Dembele and Coutinho went for extraordinary amounts, because they were fallouts from PSG flexing on Barcelona and had signed a new contract the season before leaving. Pulisic is a supposed starlet and went for £58m. De Jong is definitely a starlet and went for £70m. Sancho going for £160m is frankly absurd, he'd probably break £100m, but not Mbappe levels of price. Contract lengths are very important, because they act as a reference point for valuation. X amount of wages will add to the valuation, Sancho is good for 30 goals and assists so buying a player to replace that for the 3 years they'll lose will add to the valuation (of course Dortmund won't buy a player for that, they'll develop a player theyve bought for cheap). If Rashford or Martial need to increase up goal scoring, Sancho will be a perfect partner for them. Getting Sancho, we need top quality RB to support him, linking up with him on balls and cover space when Sancho drifting inside or to central. Realistically he’s english and very talented and appears to be stepping up both domestically and internationally. £100m is going to be the fee we’re looking at. I don’t however think he’s good for 30 goals and assists combined. It’s not certain that he’ll bring that to the table if he moves to United but he’ll definitley add a much needed threat to our right flank and as a result free up Rashford and Martial a lot more. I do think he’s exactly the kind of player we need. Skilful, pacey, young and potentially a world class player in the making I’d happily see us break the bank for him. Nonsense. Did I say the players coming out of Germany league are poor or that the league is so one sided that it's hardly the barometer to gauge someone's ability and that's the same for Scotland too. Liverpools CB played in Scotland, no one was rushing to sign him until he came to Southampton. Yep they have 4 teams in CL because it's German football but 2 are generally shite and would be below West H or Everton in they played in the PL. Dortmund wouldn't make the top 6 and BM might not either. Too funny cause if watching a football team constitutes having an opinion about a player, this forum is screwed. I wonder if you watch all the teams that you have an opinion about their players? Not saying Sancho isn't good, just it's a massive risk paying that kind of money on unproven talent. We are still playing catch up and are still way behind City and Liverpool. They can take risks cause they are coming into a successful side, we are still talking about needing 4/5 players with question marks over others. You basically said you can’t judge talent in the Bundesliga because it is uncompetitive, like Scotland. At the same time, the players coming out of the league aren’t poor? Confusing. Then you admit that you haven’t watched Sancho, but you should still have an opinion on him and we should all listen to it. Oh, and and most of the others of the caf don’t watch players, but form opinions anyhow? Bizarre. Even if you are just watching YouTube highlights, it’s better than nothing — and you should mention that it’s YouTube highlights that formed your opinion. If you’re saying that buying Sancho is a risk because the Bundesliga is not as competitive a league as the PL, that’s legitimate. We know that. There is always a risk when a player moves from any league to the PL. Clearly, teams in the PL frequently take this risk. Lots of players move to the PL and it doesn’t work out. But we are always going to scout other leagues and buy from those leagues. Sancho is doing it at 18 in his first season of senior football though. If we buy him it's not just for his current abilities but for his potential. Sancho is on 23 goals and assists, with 7 games to go he'll get close to that. Which gives Dortmund leverage. They are going to lose a lot of end product selling Sancho and will want to be compensated accordingly. I agree that someone like him would be a good fit for our right side. He’ll get close to that this season I agree but I thought you meant he’s good for 30 in the PL which I would argue is harder to do so I wouldn’t use that as a bargaining tool. "His form has seen him linked with a return to the Premier League with Manchester United repeatedly cropping up in reports, but Watzke has dismissed that speculation and insisted the 19-year-old will be at Dortmund next season. "We will not sell him, that is fact. It is clearly discussed with every person who is involved that Jadon plays in the next season for BVB," Watzke told Eurosport Germany." He isn't going for less than the likes of 120-140 million I reckon, he's moreorless as valuable to them as Dembele was, and then there's the english club/player inflation on top of that as well. Saying that it's worth it for a potential world class, already brilliant English right winger at 19 years old. Going to require an astronomic fee it seems. Still feel we should get rid of players and make it happen. Why are all these Dortmund fans popping up on the forum just to post stories about how Sancho 'isn't for sale'? It's like Glaston with Poch. You do realise that posting these links isn't actually going to affect whether he stays or not don't you? I remember there being a similar stance on Dembele. If we carry on being a laughing stock I think we'll become a much less attractive club to join. All I see on Twitter from last night is Phil Jones and Chris Smalling GIFS. How the heck have they been offered new contracts!? Mkhi had one average season, one terrible season and one brilliant season. He was late 20s when he joined us, (27 years old?). On top of that, what leagues are we meant to buy from? Just the PL? Is La Liga allowed despite the defending being awful at times? Serie A? Ligue 1 is a farmers league so we should ignore everyone there I guess. It's a dumb argument. The Premier League has awful defending at times as well. I wouldn't bother with such stupid arguments, I mean the other guy's argument. By which token, teams shouldn't have bought: Firmino, hell Salah came from Basel and Ronaldo from Portugal! There has been alot of one season wonders out there in other leagues that's been sold to premier league clubs that have failed. I just think something needs to happen. A player can be linked from Jupiter league to bundes league and the price is 15£ then a couple of teams from premier league is interested and suddenly the price is 60£. It will ruin and bankrupt clubs if it continues like now. After just turning 19, very unlikely but he will instantly improve us. We have no width or creativity on the right. That is exactly what Sancho provides. The biggest benefit for us in signing a creative RW is it gives the opposition more to think about, thus spreading their defensive line across the field as opposed to being able to double up on the left. Our heat map is shocking, we're so one dimensional in our approach on the left side and have been for years. I don't think he'll hit the ground running in his first season but with a lot of trust he will become a class player. You're paying for the potential in the quoted numbers, not the current form. When we were buying Pogba from Juve the Juve fans never believed it would happen till the very end as well. Didnt Riaola throw chairs and Dembele trashed his house to speed the transfer along? Still something is not healthy for Teams playing In premier league look at Fulham they spent so much money on average players if they had gone to any other league they would cost nothing but sence it was Fulham they paid alot for scrap. Not that many years ago teams that was in premier league ended up relegated and teams went bankrupt cause of the prices it is as soon as English clubs want a player. Yes Sancho might have talent but anything over 60£ for him is crazy. And then extra money if he plays enough matches. I've never heard so much hype about a player who has done feck all. Fans are acting like he will be our saviour! Thats the state of the market now. I feel that 150 for dembele and 120 for Coutinho were crazy fees, not to mention the 200m Neymar fee. If we can't get Sancho this summer then all roads would lead to Zaha for the RW spot. Maybe Palace would be happy to take one or two of Bailly, Fred, Chong, Gomes on loan and wads of cash to part with both Zaha and Wan-Bissaka. I think he's very talented but not what we need right now, this forward line needs an experienced player added to give us what Sanchez was supposed to give us, not another kid. Plus if Rashford is going to play as a #9 the 4-3-3 is not going to work, look at how vital Firmino's hold-up play is for that Liverpool front 3, or how Sterling, Sancho and CHO all played off Kane's work as the central pivot in the recent England games. That's not Rashford, he gets knocked off the ball too easily and is best when running in behind and relying on his movement, not with the ball played into his feet where he acts as an attacking fulcrum for the wide forwards. You have to look at it like a jigsaw, people are obssessed with the right side but you need the #9 that can facilitate the right side as well. The 4--4-2 diamond is when we look at our best and Sancho doesn't really have a key spot in that formation right now. It's good with young players you can shape them and Solskjær has used some seasons to make Molde the team it is now. They have also found several good unknown African players that's been sold after having good seasons. Question is if the supporters have patience to wait for Ole to build a team of youngsters. He will succeed doing that. But I think the supporters want success now not in 3-4 year's. So? Should that matter? Does it matter? I think he's very talented but not what we need right now, this forward line needs an experienced player added to give us what Sanchez was supposed to give us, not another kid. what RWs in their primes are actually available though? I mentioned in the rest of my post that I don't think we need a RW as we don't have a #9 that can play the pivot role in a 4-3-3. I think the attacker we need is for the tip of the diamond behind the split strikers, where Lingard and Mata have had a couple of decent games for us, we need to upgrade that position IMO. 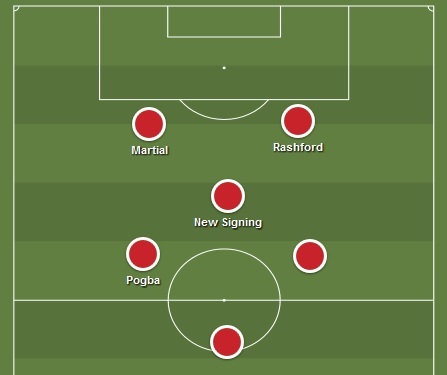 who would you have start at RW then, Lingard? Lingard needs to be a squad player, he's never going to be good enough as a starter. we definitely need a RW IMO. There's no RW or LW in a 4-4-2 diamond. The 2 strikers can split and offer width at different times and your fullbacks create the bulk of it. Are you taking crazy pills?! We need to buy at least one winger. How many top clubs don't have someone who can play wide? Especially at United... We have no-one. And our full backs are hardly marauding attackers who can create lots of chances. We need at least one for RW. Maybe Shaw can do the job next season, but ideally I'd want a left sided forward too if Martial doesn't improve. No, I've not been taking any pills, I already explained that just buying a winger wont work due to who we have as striker options, none of them can hold the fecking ball up so a front 3 wont work, hence why the diamond has been our best formation. So no, we don't NEED a winger as one doesn't fit with the primary formation that gets the most out of the strikers we have. We can't buy in every position and we need to buy the players that will upgrade the 4-4-4-2 diamond before adding in a squad winger as an option, maybe if you can get a cheap one like Lozano for £30M then do that, but it's not a priority £100M signing. He didn't trash it, he left it in a mess, it was a house he rented from Jürgen Klopp's family. He just basically left very quickly to go to France when he walked out on Dortmund to try and force a move, and left lots of rubbish everywhere apparently. I don't think Sancho would act like Dembele did either. I suppose it will depends on how much his head will be turned at the end of the season. Right now he has plenty to concetrate on with his football! We’d need a top class RB too there. We need one anyway, tbf. Yeah, regardless of formation we need to sort RB out.